A science fiction fiasco, Dune is a disastrous epic, the ineptitude registering at a jaw-dropping scale. Set in the distant future, the plot is convoluted beyond belief. The comprehensible core is a battle for control of the desert-like planet Dune, which is the only source in the universe for "the spice", which is required to fold space and enable "travel without moving". Paul Atreides (Kyle MacLachlan), the son of Duke Leto Atreides (Jürgen Prochnow), is a "chosen-one" type destined to save the local population of Dune, while Padishah Emperor Shaddam IV (José Ferrer) and the despicable Baron Vladimir Harkonnen (Kenneth McMillan) are engaged in power hungry conspiracies. 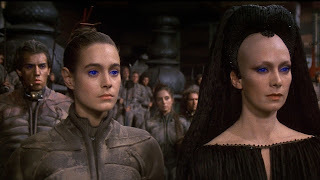 The production of spice on Dune is hampered by giant subterranean worms that eat anything they deem annoying, and a large assortment of nondescript people, creatures and places enter and exit the plot with little consequence, but blue eyes and the "Water of Life" are important parts of the fantastical universe. For anyone unfamiliar with Frank Herbert's source books, Dune the movie is overwhelmingly incomprehensible within five minutes. A barrage of names, places, clans and concepts is unloaded onto the screen through narration (including the disembodied head of Virginia Madsen, who otherwise barely features in the movie), and voice-overs that tell us what characters are really thinking once they stop talking. Director and writer David Lynch appears utterly clueless on how to translate Herbert's admittedly difficult epic onto the screen, and the bumbling storytelling on display is something to behold. It's impossible to follow who is who and why, and scene after scene comes and goes featuring barely defined people and creatures conspiring with and against each other. The multitude of characters brings forth a massive cast featuring the likes of Francesca Annis, Brad Dourif, Patrick Stewart, Linda Hunt, Freddie Jones, Silvana Mangano, Dean Stockwell, Max von Sydow and Sean Young. They mostly stand around, often in a crowded flat line, and spout gibberish in full pantomime mode. Then there is a Sting, who tries to introduce menace but only succeeds in further escalating the madness quotient. The special effects are worthy of B-movies from the glorious cheap sci-fi era of the 1950s, while the set designs are a garish steampunk nightmare. The action scenes appear staged by children, and mostly consist of dorky extras aimlessly running around the desert. 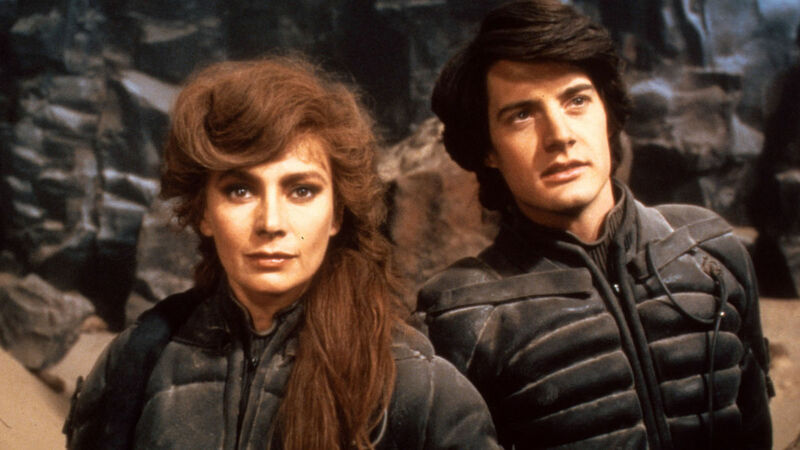 It is exceptionally difficult to avoid the impression that Dune is intended as a bad joke, a big-budget reimagining of Plan 9 From Outer Space to stake out new boundaries of awfulness. But unfortunately it's not a parody, just a sad exercise in large scale incompetence. Yeah, it's so bad. So bad bad bad bad. When I first lived in Los Anegles (circa 1990), I had a roommate who loved the Dune books and he had a weird obsession with the movie. He had it on video and sometimes he would watch it for 30 minutes or so and make fun of it. He also had a bunch of Dune-related catchphrases that meant nothing to me, though I still remember "Is this not the meaning of Sianouk?" He talked me into going to see it at a revival house. Hey, I love a fun time at the theater making fun of a cult movie as much as anybody … but not this one! It was a chore for me! But the theater was full of people who were having a great time, screaming and yelling and laughing. And I have a friend who I call Giallo Danny, who loves Italian movies and the French New Wave and Pasolini, and he sees just about every important foreign film on a big screen. Big Kubrick fan. He told me to shut up when I started critiquing Eyes Wide Shut. But every once in a while he throws me a curve and starts talking about something that I would NEVER have thought he would even sit through. He loves Ishtar. (I do too.) And he loves Dune. go figure. Dune was so bizarre in such a bad way that I honestly could not believe what I was watching. It's difficult to imagine how much has to go wrong for such an atrocity to exist. I changed my opinion about this film from not liking it to exact opposite, now I see it completely differently than I Used to, now I think it´s a beautiful film. I've read that many people ended up changing their mind about this one. I doubt that I will, but I'm happy that it found a fan base. But I must admit, that I changed my mind after I read the book. Suddenly i started to appreciate what Lynch did in the movie. Before I just didn´t understand it what was it all about, the book helped me to understand the film. Makes sense. I know some people who had first read the book and were greatly disappointed by the movie, but obviously the film is polarizing and Lynch's vision is unique. I just want to say, that almost everytime book is better than film, especially Stephen King´s books are alwyas better than films made by them, One exception is Carrie, which I think film is better or as good as the book and The Shining movie is so different than the book, that is almost not an adaptation but a whole new thing just loosely inspired by King´s book. But back to Dune, if I never read the book, which I read few months ago for the first time, I´d still not be able to appreciate the film I think. On the other hand, if I never saw the film, I would not be able to understand the book which is very complicated for reading because of so many unusual words Herbert uses, but because I knew the film I better understand his words...so it was good symbiosis of both things, which were hard to understand separatedly. I fully agree books are usually better. It's quite a skill to distill an engrossing book into a two-hour visual story, and moviemakers usually make the mistake of trying to cram in too much into the film.